Welcome to the glorious Green Mountains and Mad River Valley of Vermont. Nestled along the river, the elegant, relaxing inn is your vacation getaway home and the starting point for your riding explorations on the smooth gaited Icelandic horse. You will be venturing into the Mad River Valley resting between the Green Mountains and enjoying country inn hospitality at its finest. 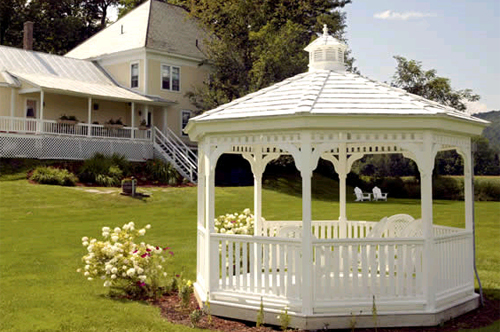 From the moment you enter the sunny front room of the Victorian style inn, with its white wicker furniture and pastel floral prints or take in the flower-bedecked back porch veranda overlooking the pretty gazebo and the lush gardens in open fields, you will know you have arrived to the heavenly Vermont countryside. You will be riding through green meadows, quiet forests, and of course, along Vermont's famous dirt country roads. You will be greeted by the rivers and streams which cut into the mountains and on warm days you are welcome to take a refreshing swim. You'll enjoy very comfortable accommodations and gourmet dining, all with a generous helping of Vermont hospitality. When you awaken, you will be served a delicious three-course gourmet breakfast, and you may be accompanied by a hummingbird or two. During the summer, we serve breakfast outdoors on the covered back porch. Breathe in the landscape, distant red barns, meadows of wild flowers, fields of corn. The warm hospitality and relaxed atmosphere make you feel right at home. For lunch we bring either a delicious picnic to eat at a pretty spot or we stop at a specially selected restaurant. After riding, you will come back to the inn for the daily afternoon tea, the lights go dim and soft classical music fills the air. Choose your favorite tea and cup from the inn's private collection of antique china. Savor your beverage in front of our cozy fireplace. Breathtaking views, unique horses, and a charming inn with wonderful food, make this a very memorable riding experience. The Icelandic horses are extremely hardy and tolerant, but part of what makes them so special is the fact that they control five gaits – making for a very smooth ride. The combination of the horses' smoothness and our Icelandic saddles, designed for many hours of use, ensure a comfortable ride. In Spring, life unfolds here, as the grass turns green and the trees begin to look like a pastel painting. Flowers and blossoms appear at every turn, and nesting and migrating birds fill the air with motion and song. In Summer, refresh yourself in one of our local waterfalls or swimming holes, or try a round of golf at Sugarbush's famous 18-hole course, designed by Robert Trent Jones. Our quiet country roads and trails invite road and mountain cycling. Make a wish as you walk through one of the Valley's covered bridges, and amble through the Saturday Farmers' Market for produce fresh from the field, locally-made crafts, foods, and live music. On Independence Day, follow the crowd to the Warren Fourth of July Parade. In August, the Festival of the Arts offers a wealth of choices for every taste. In Autumn soak in the multitude of the fall colors and enjoy the splendor of nature's magnificent color wheel, go antiquing, soaring, or visit the Inn's own pumpkin patch. Non Riders are welcome to join their friends or spouses - plenty of things to do in the area while they ride! Rates include*: Lodging, breakfast, 4 lunches and 3 dinners (Mo, Tu & Th), 4 or 5 riding days. Best to rent a car and drive in on own! Rental car also very helpful for exploring the surrounding area on own time. Day 1 Sunday: You may arrive at the inn in Waitsfield any time after 3:00 pm. Dinner on this night is not included, but we will be very happy to help you make a restaurant selection. There are many wonderful dining experiences here in the Mad River Valley. There is a hot tub, so don't forget your bathing suit. Day 2 Monday: Arrive at the horse farm around 9:30 am for an orientation, and an introduction to the Icelandic Horse. Then a brief discussion and assignment of horses. There will be an opportunity to view a video about the history and gaits of the Icelandic Horse. We will then have a short hands on education down at the riding arena and track. We will help you with gait transitions and individual instruction as it pertains to your horse. Then we are off to practice what you have learned. Lunch is at the farm today and in the afternoon you will be able to try a different horse if you wish. Day 3 Tuesday: Today you will really get into the gaits while enjoying magnificent views along the way. Lunch is at a pretty spot by the river. Then off for more riding through forests and neighboring farm lands. Back at the inn you may choose to relax before dinner, or explore the wonderful walking trails along the river or take a swim... or maybe back in that hot tub! Day 4 Wednesday: Our journey continues via the "Enchanted Way" through the marvelous terrain used by cross country skiers in the winter. Today will be a short riding day. We will arrive back at the farm. You have time to have lunch in town (not included) and then go shopping or to do as you wish. A canoe trip can be arranged or maybe you would enjoy a massage (extra charges apply). Tonight you are on your own for dinner, we suggest a short trip to Stowe, a quaint resort town, with many fine shops and restaurants. Day 6 Friday: Today we will ride up through the mountains along scenic stone walls and through old farm lands, even coming across stone foundations dating back about 100 years. Lunch is back at the farm, and for those who wish to ride in the afternoon, we will be off for more tolting! There are several options for number of nights and riding days – the choice is yours. Each days ride is approximately 5 to 6 hours. Wednesday is only a morning ride. Children over 10 years with riding experience are welcome if accompanied by a parent or an adult. Groups are kept small, 2-8 riders plus guides. Pace and distance ridden in one day (there are alternate routes) is decided by the riders. The horses are kept at the riding center most nights - from where you ride out. On some days they will stay stay out in a pasture waiting for you the next morning. The horses are ridden in equipment traditionally used in Iceland. The saddles are quality English saddles made especially for the Icelandic horses and are comfortable for both the horse as well as the rider. Bridles have snaffle bits with drop nose-bands. Saddlebags and water bottles are available. Helmets are required and are available for those who do not have their own. All horses used are imported, purebred, carefully selected Icelandic Horses. The breed is famous for stamina, gates (horses are 4 or 5 gated), pronounced homing instinct and gentle disposition. These horses are small, but do not have any trouble in carrying an ordinary sized rider up to 225 lbs. long distances. Riding Icelandic is certainly a unique experience and one never to be forgotten. Versatility One of the keys to enjoying Icelandic Horses is their well-rounded versatility. They are superb, natural jumpers, enthusiastic driving horses, and competent, talented partners in dressage. Endowed with tremendous stamina, Icelandic Horses stay healthy, fit and mentally well balanced with minimal stress and training Bred to carry adults smoothly and willingly over difficult terrain, Icelandic Horses bring their cheerful outlook and sensible attitude to each ride. Always willing and energetic, they are forgiving and patient with beginners, yet offer the competition rider a challenging experience. Strong, yet never intimidating, and capable of carrying large adults due to their unique bone density, Icelandic Horses average 13 to 14 hands in height. Icelandic Horses are found in all colors and have beautifully defined heads and abundant manes and tails. In addition to walk, trot, and canter, Icelandic Horses also tölt, a four-beat running walk that produces fluid, rhythmic, forward movement. The tölt, the most pleasurable gait, is free flowing and effortless, allowing the horse to cover rough terrain swiftly. Many Icelandic Horses also pace, an exhilarating racing gait which can be performed at speeds up to 30 miles per hour. Whichever gait you choose, Icelandic Horses perform naturally and smoothly—no bouncing, no posting! Why are Icelandics always called horses and never ponies? The word pony is an English invention, probably from the old French word, poulenet, a diminuative form of poulain, or colt. So it defines small breeds on the British Isles like Shetlands, Welch, Dartmoors, Exmoors, and Connemaras. But pony is often used imprecisely. For example, it's used to describe polo horses and mustangs, which aren't necessarily small. The Pony Express in the 1860's used thoroughbreds and Morgans. In Iceland, which had its own written language when most of Europe still relied on Latin, they're called only one word, hest, or horse The Icelandic’s that are used are well trained, willing, and “tolt” beautifully. The tolt is a smooth four – beat gait appreciated by long- distance riders. Saddles are English Style with special tolting saddles available. Almost all groups end up doing some walking, mostly tolting and a bit of cantering. May and June's days are warm with temperatures in the 60’s and 70’s F, sometimes 80’s F. However, nights are cooler (50’s F). July and August are usually warm months and can occasionally get hot (90’s F). In September and October you will find warm days still, while mornings and evenings are cool, sometime as low as 30’s and 40’s F.
The Fall Foliage Season usually begins around mid-September and lasts until mid-October, with peak colors appearing around the first week in October. Of course this varies depending on the weather. The leaves start to turn in the northern part of the state first and gradually work their way south. Also, in general, higher elevations start changing before the lower elevations. For convenience these are some things that we recommend to bring along. - Riding breeches, chaps, or comfortable sports pants. Some people tend do to be sore when riding in jeans. If you do decide to wear jeans; chaps, or half chaps are recommended. - Paddock boots are most practical on this ride, but feel free to wear what you are most comfortable in. We will be doing some walking to loosen up, so it is very important that your boots are comfortable. Dress for the season. Attire in the evenings is casual. In May and June the days are warm with temperatures in the 60's and 70's. Nights are cooler, in the 50's. July and August are usually warm, and occasionally hot, in the 90's. In September and October, you will have warm days, with cool evenings and mornings, sometimes in the 30's and 40's. You may need a sweater, as it does cool down at night. Bring a bathing suit, sunscreen, and riding gloves. Riding helmets are required and if you have your own you will be more comfortable; but one can also be borrowed from us. This goes as well for rain gear. Optional equipment includes; a camera, water bottle, a belt pack for personal belongings, and sunglasses. If you would like to book the Massage Therapist please contact Hidden Trails for details and confirmation. On this stationary ride, all nights are spent at the same location. You are free to arrive at the Inn any time after 3 pm on Sunday. The lounge has cable TV, DVD, stereo, wood stove, guest refrigerator, and a pool table. In the evening, enjoy our Hot Springs hot tub on the back deck as you gaze upon the sky saturated with stars. Wi-Fi is available at the Inn. There are laundry facilities in Waitsfield if necessary. Single travelers pay a single room supplement unless we can find a roommate for you. Most meals are included on this trip, except for dinner on arrival day. As much as possible we serve locally grown food (farm to table). Breakfast and dinner are at the Inn and lunch is at the farm. Breakfast is served from 8 – 9 AM but fresh brewed coffee is available by 7 AM to take to your room or in any common room including our sun room.A nice variety of teas are available 24 hrs a day from our tea table. In late afternoon/evening; cookies or baked goods are waiting for you. We serve a delicious 3-course breakfast with nice presentation on antique china, all made from scratch with fresh and local ingredients. Varies daily. Sweet one day and savory the next. For those who prefer a lighter breakfast; cereal, granola, yogurt and almond milk is available. Alcoholic drinks are not included in this trip but you are welcome to bring your own at dinnertime only.